Let’s begin with the debates about comparative, transnational and global approaches to ‘history from below’, spurred by remarks at the workshop from William Farrell and Tawny Paul. The idea that global history – typically vast geographical transactions of people and commodities – can combine with social history – prioritising analytical depth over geographical breadth – poses methodological challenges for historians, and the issue was the focus of some provocative debate at the workshop. How, though, might social historians ‘from below’ consider larger comparative examinations without diluting the detail and depth of their own approaches to the subject? Of crucial importance is focusing on a strong research question. One of the shortcomings of comparative history has been the tendency to locate similarities in different countries with the sole aim of debunking assumptions about the geographical uniqueness of a particular historical development or event. Indeed, this was an initial weakness of my MA research, which compared the public consumption and retail of alcohol by women in early modern London and Paris. While it is interesting to historians of drink, for example, to find that – contrary to the conventional wisdom – women in seventeenth-century England and France continued to brew beer or cultivate wine, what do we really gain from this observation? Furthermore, while the historiographical revision may be important, what does the comparative approach lend to that revision beyond a simple duplication of the same argument? Central to both of Bloch’s observations, however, was the use of comparative theory to explain historical complexities, rather than simply identify them. In the first instance, why was it that Florence and Genoa issued coins before any another other European principality? In the second, why did England and France differ in their agricultural techniques if they shared the same land conditions? Comparison should only be used when there is a genuine problem to be explained. Social historians should use the technique of interregional and international comparison in the same way, as a tool for explanation. What social historians do so well in their relative ‘histories from below’ is use intensive studies of local archival collections as tools to ask large historiographical questions of small spaces and places. Yet, constrained to this restricted geographical focus, they are not always equipped with the other set of tools that allow them to explain why certain conditions exist, how they change over time, and where their history fits within broader national and international contexts. Comparative approaches are potentially one of these ‘other’ tools for parish and local historians in general, though social historians ‘from below’ in particular, provided that they are asking the right questions with that approach in the first place. The value of the comparative method should be its ability to reveal new perspectives to the study of ‘history from below’, which social historians examining one country, region or parish in isolation could not. A mixed company or a plebeian space? Benjamin Eugène Fichel, Le café de Ramponneau (1877). The workshop’s second thought-provoking subject considered the problems of identifying the individuals that formed ‘the below’ within ‘history from below’, including the spaces which historians have used to locate them. One particularly prominent space in my own research has been the early modern public house (specifically the alehouse for England, and the taverne for France). Rather than simply institutions ‘run by the poor, for the poor’, these humble social spaces were populated by a mix of people ranging from poor migrants, day labourers, sailors and journeymen to artisans, guild masters, well-to-do merchants, and, potentially, even members of the elite if they were unable to find lodging and victuals elsewhere on the day.2 The historiographical revision of alehouse and taverne clientele does, however, generate some new challenges for ‘history from below’. 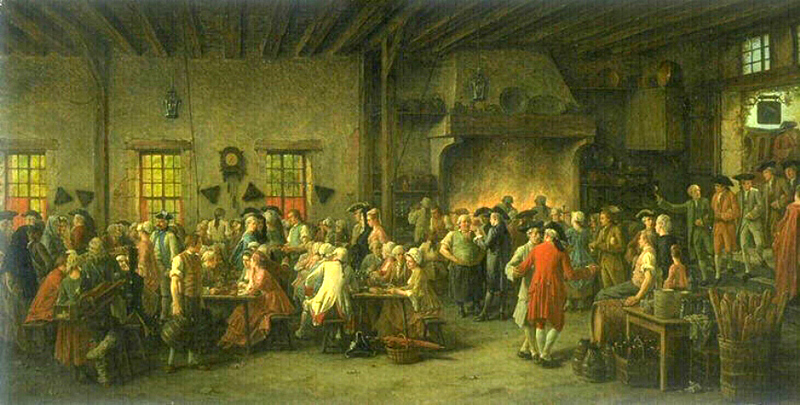 If alehouses and tavernes are typically used by historians to study the attitudes, behaviours and cultures of ‘plebeian’, ‘common’, ‘ordinary’ and ‘popular’ men and women in early modern society, are these labels still appropriate (and are drinking houses still appropriate) in light of a convincing body of research emphasising the social diversity of these community institutions? In short, if historians are using drinking houses to write ‘history from below’, who are they writing that history about? This issue becomes clearer if we consider a specific example. In Bristol, 1654, James Baber and William Harding had been drinking peacefully together at an alehouse on a Tuesday evening. Having finished an initial round of drinks, Baber tried to persuade Harding to pay for the second round – “sevral cuppes of Ale”. Harding was more than happy to acknowledge the request, though, provided that Baber removed his hat first. The men’s peaceful sociability soon transcended into a furious exchange of verbal and physical violence, concluded by their apprehension at the hands of the local constable. What had turned the tides of this alehouse episode? Baber refused to remove his hat. What is crucially missing from this case is more information about the identity of James Baber and William Harding. What was their profession? Were they local to the community? How old were they? Most importantly, to what social status did they belong? Knowledge of this kind would fundamentally transform the way in which historians read this seemingly trivial alehouse incident. If Baber was a ‘middling’ or ‘better’ sort of early moderner, while Harding of the ‘poorer’ sort, this case would suggest, in the first instance, that an alehouse ‘history from below’ is a more socially inclusive history that a simple study of the culture of an ‘ordinary’ and ‘plebeian’ space. My improvised social separation between Baber and Harding would also suggest, however, that Harding’s insistence for Baber to remove his hat represented a subversive challenge to a social superior’s authority and identity. Furthermore, the case might also suggest that alehouses afforded a privileged spatial context for ordinary men, such as Harding, to exercise a political agency that may not have been as readily available in different community spaces. My categorisation of Baber and Harding is obviously merely wishful speculation, and my (very frustrating and time-consuming) searches through Bristol’s archives did not produce any more information on either James Baber or William Harding. However, historians researching the ‘history of below’ of early modern Londoners may be in a more advantageous position. Fantastic projects such as ‘London Lives’ now allow historians to investigate the background lives, locations and social characteristics of (at least some of) the individuals they might encounter in court records before they arrived in court, or, say, before they fell into dispute with a drinking partner over the demand to remove a hat. The digitised resource’s capacity to create biographies of historical agents, and cross-examine their experiences across time and space in the matter of a few minutes, potentially offers a whole new layer of detail to ‘history from below’ as an approach, and could profoundly reform how we define, where we look for, and which historical agents we include in our ‘histories from below’. I hope in reading this short post that I have, at best, convinced you of the benefits of embracing global, spatial and digital approaches, or, at least, sparked some intrigue with regards to their potential. Yet, strangely, when the words ‘global’ or ‘digital’ leap from the mouths of delegates during conferences or academic conversations, it is often as if the historians listening to these words heard “social history is insignificant”, followed by “archive sources are useless”. On digital resources, earlier posts from Mark Hailwood, Brodie Waddell and Richard Blakemore, and the detailed comments they provoked, have excellently summed up some of the many challenges and contributions that digitised databases present to future historical research. If used responsibly and read critically, like any other historical source I might add, digital databases such as ‘London Lives’ and hopefully further nationwide projects could allow us to write a ‘history from below’ that goes far deeper into the hidden reaches of that history than historians have previously been able to. Similarly, global approaches, if employed responsibly and for the right purposes, could enable historians to generate new research questions, as well as answer and explain currently unsolvable ones. There are two major challenges in incorporating these sorts of approaches to the future of ‘history from below’. The first is to construct the theoretically rigorous basis for them to co-exist; the second is getting social historians to view these approaches as contributions to their discipline, rather than competition. 1 M. Bloch, ‘Pour une histoire comparée des sociétés européennes’ in Revue de synthèse historique, 46 (1928), pp. 15-50. See also a review Marc Bloch’s ‘Logic of Comparative History in William H. Sewell’s piece in History and Theory, 6:2 (1967), pp. 208-218. 2 P. Clark, ‘The Alehouse and the Alternative Society’ in D. Pennington and K. Thomas (eds. ), Puritans and Revolutionaries: Essays in Seventeenth-Century History presented to Christopher Hill (Oxford: Clarendon Press, 1978), 53. For revisions, see B. Kümin, ‘Public Houses and their Patrons in Early Modern Europe’ in B. Kümin and B. A. Tlusty (eds. ), The World of the Tavern: Public Houses in Early Modern Europe (Aldershot: Ashgate, 2002), 44-62. This entry was posted in Theory and methods and tagged history from below event, the craft, the final frontier by manyheadedmonster. Bookmark the permalink. You raise some important issues, Matt, all of which deserve careful consideration. I just have one small contribution which is to mention yet another digital resource that might have implications for the vexed problem of identifying the many people that we come across in the archives who aren’t famous enough to have an entry in the ONBD or on wikipedia. It’s called ‘Connected Histories’ and it too is a product of the irrepressible Hitchcock/Shoemaker tag-team (along with Jane Winters, Sharon Howard and others). It draws on a range of online databases that are tagged by person, place and date, allowing you to sometimes track down additional reference to people who might otherwise just be a single name in a single record. For example, ‘James Baber’ turns up a few hits, including one who was a merchant in 1656. Perhaps he’s your man? A welcome message of unity here Matt – you are right to encourage social historians to embrace, albeit critically, global and digital approaches and to think about their potential, rather than being instinctively defensive. I also think that this open-mindedness is quite prevalent, at least amongst the participants in this symposium. A couple of quick points on your alehouse encounter. You are right to say that studying alehouses cannot simply be equated with studying ‘history from below’, as their clientele was often socially mixed – and the status of patrons is often unclear to historians anyway. Still, I think they are useful as a public space that was generally _inclusive of_ if not necessarily _exclusive to_ ‘ordinary’ men (and, I would argue, many women too). If we set the parameters at finding sites which were exclusively ‘plebeian’ (such as James Scott’s ‘sequestered sites’) I’m not sure we will ever find them. I also wondered whether your bust-up between Baber and Harding could have been more about religion than social status – given that this was 1654, might Baber have been an early Quaker refusing to remove his hat?